I hope you are in good spirits and excited about 2016. I sure am because… good things are coming. But now I have a thought or two about the famous New Year Resolutions. Please don’t get me wrong, I am not saying that I don´t do this… but I´m aware of it. I think it´s kind of a herd thing….As soon as the end or the beginning of the year comes around and everybody creates New Year resolutions… I have to do it too. Yeah it feels good….we have the best intentions until we decide otherwise and they are put on ice again until next year and then the same game starts again. Can you relate? New Year Resolutions normally reflect short-term thinking, or a quick fix, instead of having a long term plan, that’s why only a small percentage of those who make resolutions achieve their desired goals….Now that’s not a good success rate. So is there a reason people don’t stick to their resolutions? Professionals’ answers are mixed. Some believe that many don´t have a strategy or someone to keep them accountable and support them to achieve these “goals“. But there is a way to empower yourself and stick to your new years resolutions. 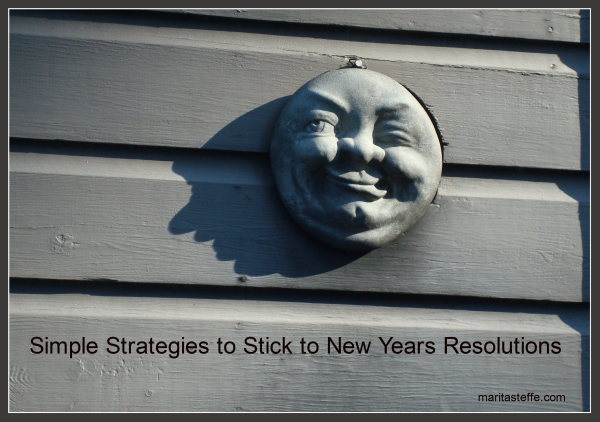 Below are some strategies that will help you keep your resolutions Steven Covey, the author of “The Seven Habits of Highly Effective People “ once said, “Some habits of ineffectiveness are rooted in our social conditioning toward quick-fix, short-term thinking.” This is how I feel about resolutions: As the CEO of a strategic marketing firm, my New Year’s Resolution is not to have one. As an individual, could I say that I plan to improve myself in 2016? I certainly strive for that on an on-going basis, but not that the start of each year. That too is a marathon, not a sprint. If you want to be healthier what does that mean for you? Exercise, eat healthier foods? Meditate, work less? Let’s just ake the example of healthier foods. What’s on the list of foods that’s not good for you? Are you willing to find a healthier replacement? Are you willing to change some habits? The key is to make it work for YOU…when you make a shopping list please…. write down things that you like to eat, don’t write down spinach and whole grain noodles if you hate them. Make it a habit to write a grocery list, with healthy foods, that you like. If you have only chips, soft drinks and junk food at home it’s impossible to eat healthier. Would you like to move more? Think about exercise that you would like to do, there must be something. Sometimes it’s easier to go for walks, go on a bike ride be in nature, or take fun classes, than to work on machines. Although I like the machines because I listen to interesting audios at the some time. What did you do that is good for you? Try to do 3 things every day towards your goal, even small things. Write down how you exercised, or what you ate….. if we keep track of something it’s easier to manage. Just simply tracking how much you are….or aren’t…doing, will push you in the right direction. If you didn’t do well…please just forgive yourself and try again….make it an experiment, there is no fail there is only: I try again!!! This will motivate and inspire you, just tell someone you trust about your endeavour, work out with a trainer, take a class, do something with a friend or get a coach. Start a little accountability group where everybody can work on their own resolution, but you still watch out for each other’s goals. All this takes you out of your “alone zone” and it will be more motivating if you are not left to your own devices. If you break your resolution today, try again tomorrow. Voltaire. Do it one step at a time and forgive yourself if you think you didn’t do it right. Try again and again and again and again until eventually you will establish a new habit. New habits get easier, because after doing something for a while new neural pathways get established in the brain.